Chia seed pudding was something that I resisted for a long time. The first few times I tried to make a version I thought it was gross, slimy, and tasteless. Fast forward a few years, and it’s one of my favorite ways to enjoy a guilt-free dessert. 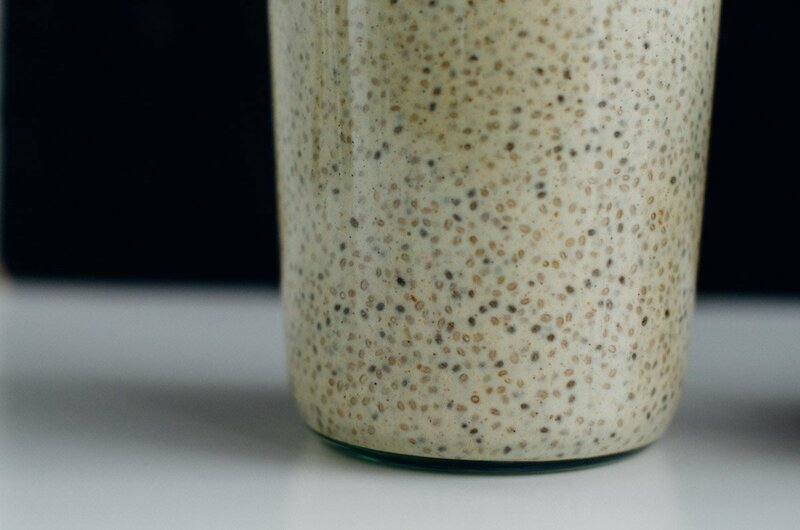 I find that most recipes for chia seed pudding are quick to put together but they taste like they are good for me if you know what I mean. While this is totally fine, I just didn’t get excited by it and definitely wasn’t compelled to make it again. That was until I found this recipe from the talented and amazing Amy Chaplin. Her book At Home In the Whole Foods Kitchen is a James Beard award-winning cookbook filled with beautiful photos, nourishing vegetarian recipes and tons of nutrition information. 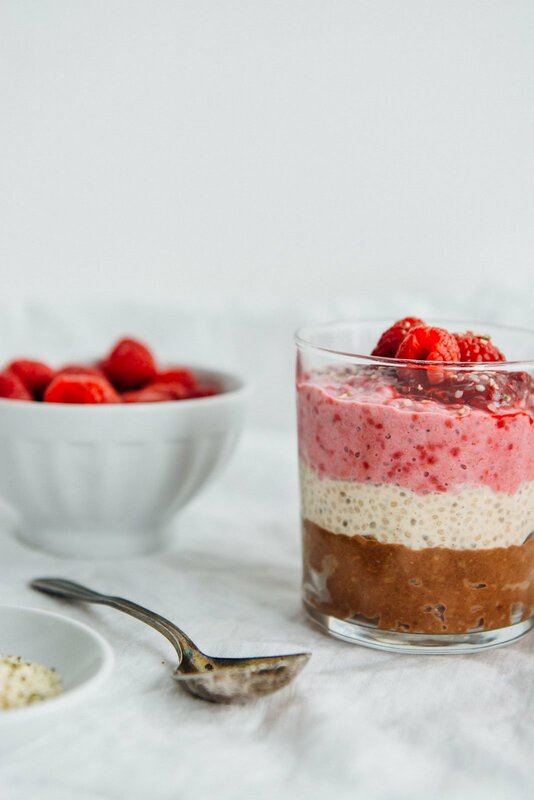 It is hands down one of my favorite cookbooks and like I said I don’t think I ever would have joined the chia pudding bandwagon without her amazing guidance. 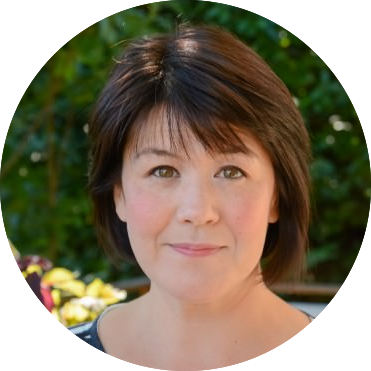 If you’ve never been on her site I would strongly recommend that you check it out, she has a way of making really healthy food that is approachable, easy to make and utterly delicious. Once we’ve made the base vanilla recipe, adding chocolate and maple syrup was a no-brainer, but I wanted a version that would add a touch of tartness and allow me to get some much-needed fruit into my diet. Initially, I tried to make an ombre layered pudding, but the layers weren’t distinct enough to me. I used frozen berries that I cooked down with a bit of maple syrup into a compote and then mixed that in. 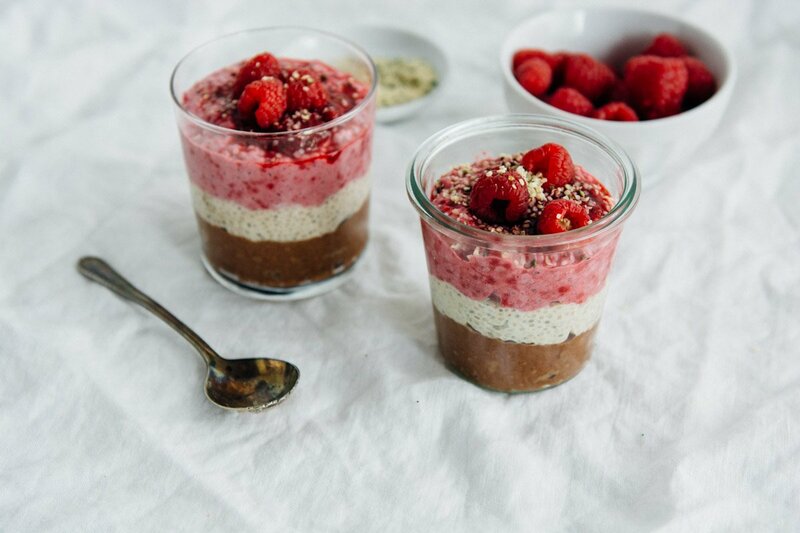 I like to keep all three versions in the refrigerator and layer them into a parfait that I top with extra raspberry compote, fresh raspberries, and hemp seeds. There is something about the combination of chocolate and raspberries that always surprises me but never fails to delight me. So you can make one or all three versions. It is totally worth the extra time to make your own cashew milk as the base but if you are pressed for time you could use store bought almond milk and add the dates and spices for a quicker version. I have a hard time deciding which one is my favorite. My son loves the chocolate one, but I would happily eat any or all three every day of the week. 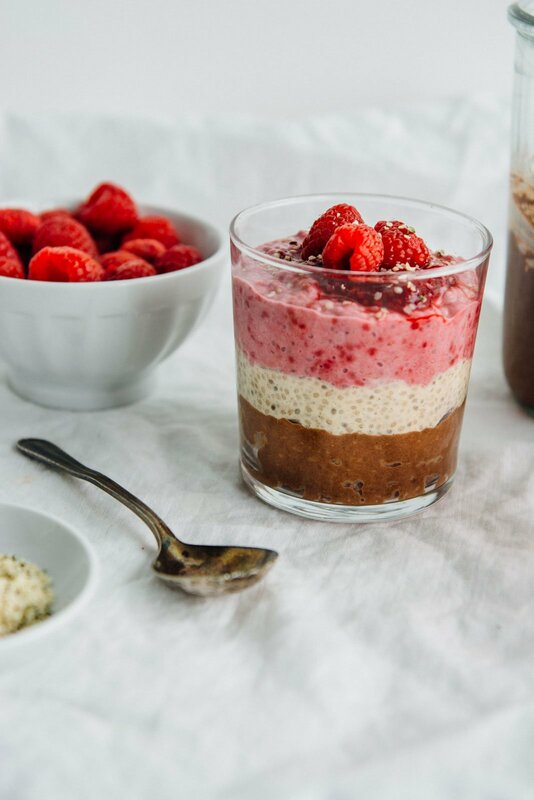 What’s your favorite flavor of chia pudding? Do you love it, hate it, or just on the fence about it? 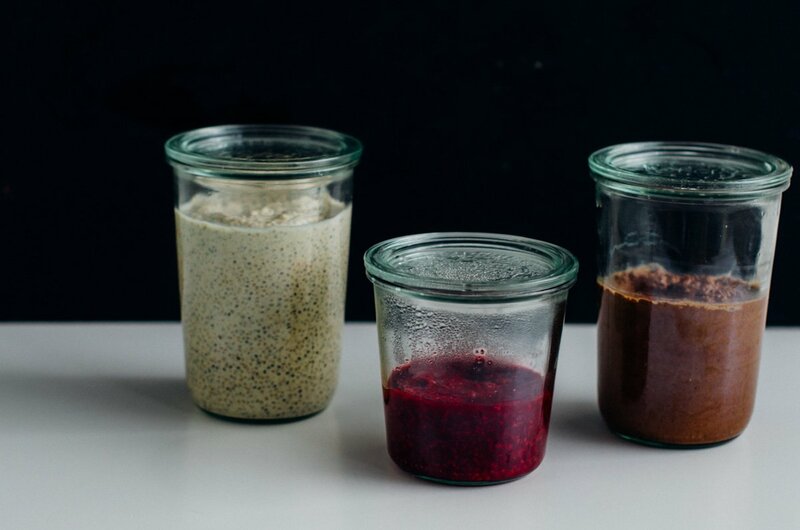 Here are my three favorite ways to eat chia pudding. 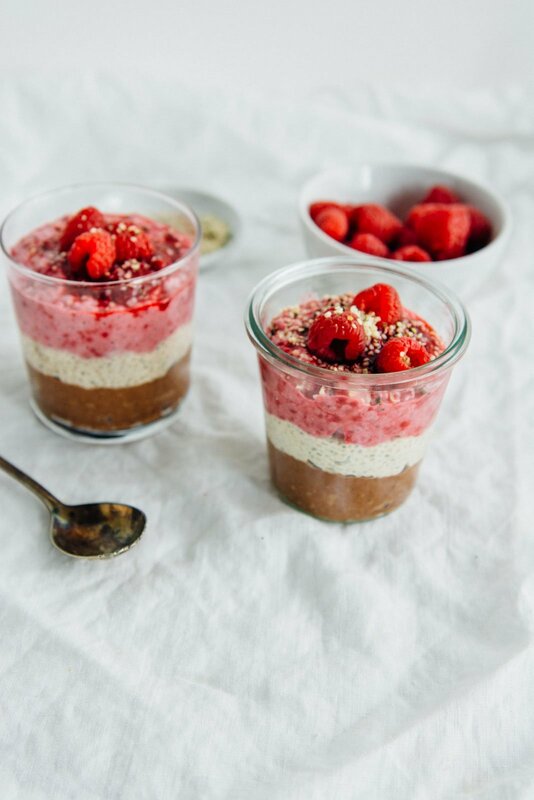 Vanilla,chocolate, and raspberry, eat them one at a time or layered into a parfait! Place chia seeds in a medium-size mixing bowl. Split the vanilla bean in half lengthwise, scrape out the seeds, and add them to a high-speed blender. Place the vanilla pod in the bowl with the chia seeds. Strain cashews and rinse well. Add to the blender along with 4 cups of filtered water, dates, salt, cardamom, coconut butter and vanilla extract. Blend on high speed for 2 minutes and pour into bowl with chia seeds, and vanilla bean pod, whisk well. 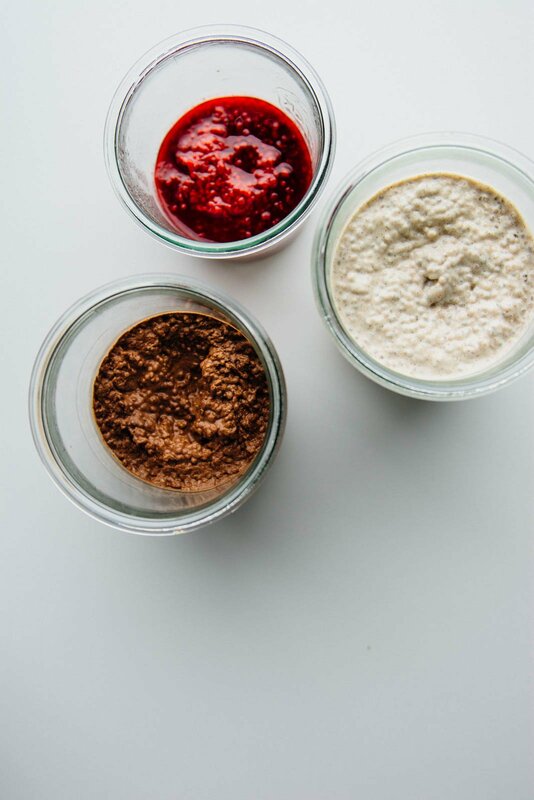 Let mixture sit for 10 to 15 minutes, whisking every few minutes to prevent chia seeds from clumping. Place in the fridge and chill for 1 hour. Remove from fridge, whisk. Remove vanilla bean pod (if using), serve chilled topped with berries. Divide the vanilla pudding into thirds, which should be about 2 cups. Follow the instructions for the chocolate and raspberry variations. Layer the pudding into cups. 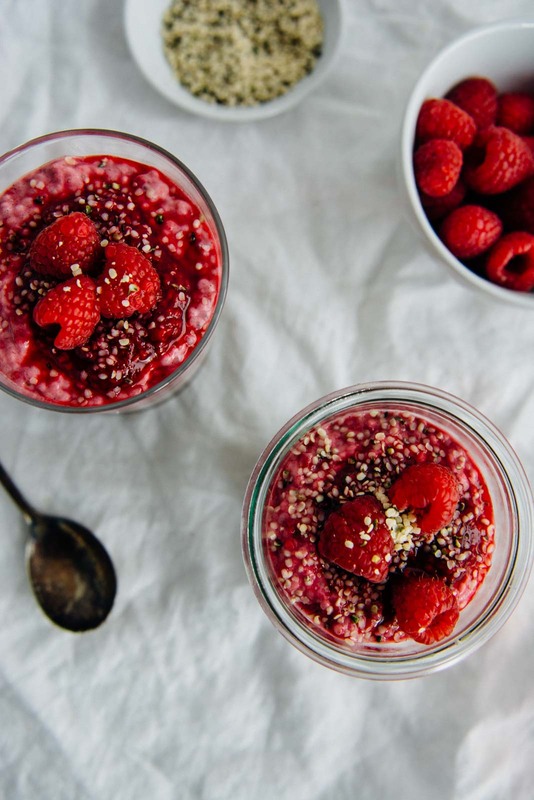 Top with remaining raspberry compote, and garnish with fresh raspberries and hemp seeds. Add 3 tablespoons cocoa powder and 2 tablespoons maple syrup. Whisk well to combine. 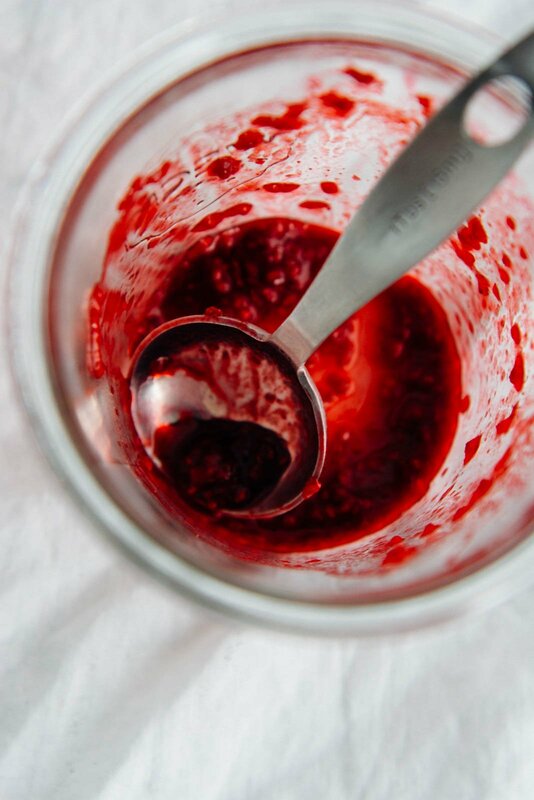 In a small saucepan combine the raspberries, maple syrup and a pinch of salt and bring to a boil. Reduce the heat to low, and cook, stirring often until the fruit is broken down and starts to thicken slightly. Let cool to room temperature. 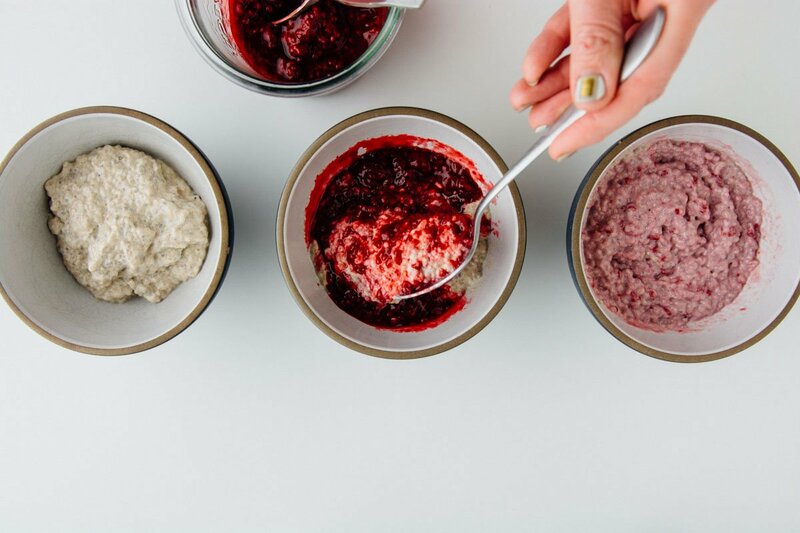 Add ¼ cup of the compote to 2 cups of the vanilla chia pudding and stir well to combine. Taste and add additional compote if desired.